Did you know that people who live in places with high levels of pollution are 20% more likely to die of complications from lung cancer than those living in less polluted areas? According to a 2009 study, a shocking 60% of Americans live in areas where pollution has reached unhealthy levels (ABC News) And we’re not talking just big, congested cities, but also areas with high concentrations of agriculture, factories, and even unique geographical phenomenons like Winter Inversions. Initiatives such as the Clean Air Act, various influential NGO’s, and the Sustainable Development Goals (SDG’s explained) have all highlighted pollution as a critical problem to solve and have dedicated their resources to helping alleviate some of the related causes. While progress is certainly being made, it has become imperative that we take matters into our own hands and defend ourselves against the often talked about harmful free radicals in our bodies. Ok. But what can I do other than just avoiding ever going outside again? I’m glad you asked. One defense mechanism you can immediately incorporate into your daily routine, that will help reduce free radicals, is super easy and tasty! Simply, increase your tea consumption! Yes, tea, the lovely beverage that warms your soul and delights your taste buds. The high saturation of antioxidants in teas help keep the body armed and protected from the free radicals floating around. And increasing the amount of tea you drink each day is one of the easiest strategies to consume antioxidants without the calories. You may be saying, ok, it sounds easy enough, but with all the numerous tea brands out there- how do I choose? Well, I want to highlight a company that I recently discovered: The Tea Spot. It is a fantastic Boulder, Colorado, based tea company founded in 2004 by Maria Uspenski. Maria is a cancer survivor who was drawn to tea for its powerful heath benefits. Sensing a trend here, eh? Fresh loose leaf tea is a must for your diet. Watch a bit of Maria’s story on the impetus to start the Tea Spot. 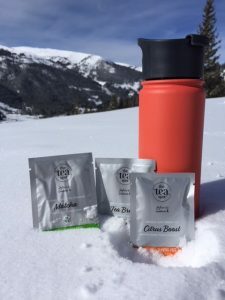 The Tea Spot is a USDA Organic and certified B Corp, which is granted only to companies that meet rigorous social and environmental standards. One of the many ways they give back is through their 10% pledge. As inspiration from Maria’s story, they donate ten percent of all sales in-kind to cancer and community wellness. To date, they have supported over 100 organizations and touched more than 10,000 lives. Clearly, if you want to feel good and philanthropic about drinking your morning tea- check out the Tea Spot. Now, let’s talk about their amazing products: I am actually sitting here drinking their pure matcha out of their Mountain Tumbler as inspiration. The Tea Spot has a plethora of teas to choose from: white, oolong, black, green, mate, herbal, and pu’erh. In case you’re like me and need a definition of pu’erh- here it is: Pu-erh is a traditional aged Chinese tea that goes through a fermentation process that gives it a scrumptious earthy taste! All of their teas are gourmet and handcrafted. The fun part is they have many signature blends, so they are a great company to try if you’re looking to spice up your tea taste routine! Did you also know tea leaves like to be carried around in style? Thankfully, The Tea Spot has a super cute and functional line of tumblers and bottles to carry and steep your tea! My favorite is their Cold Brew Bottle. As Spring forges in with summer following close behind, it’s nice to have some cool, refreshing options on hand! Throw sine loose leaf tea into the bottle, and you’ll have a cool refreshing drink all day! There are three things I look for when deciphering which tea leaves to buy and which tea companies to support: Quality, Taste, and Environmental/Social Impact. I give my stamp approval on all three. Quality and Impact are proven; as for taste- go check them out and let me know your thoughts!